1. Facing North, stars circle around a single point in the sky. 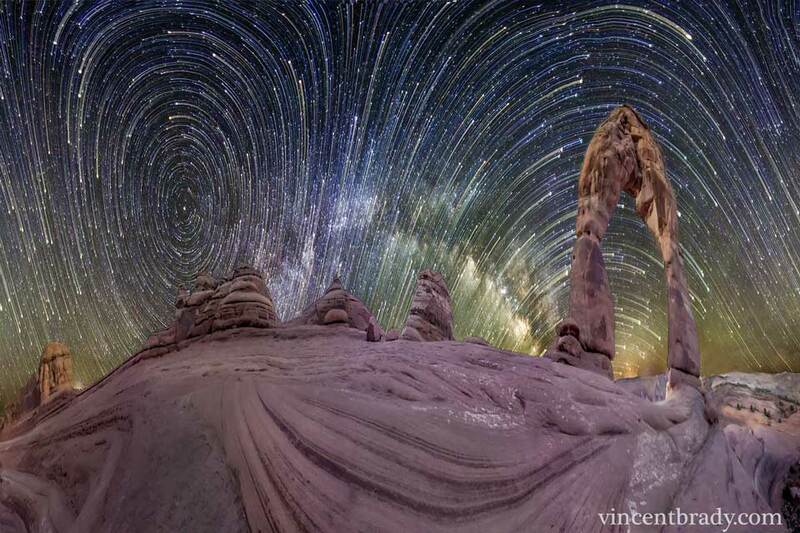 This is called the North Celestial Pole. 2. Facing South, stars circle a different point in the sky. This is called the South Celestial Pole. 3. 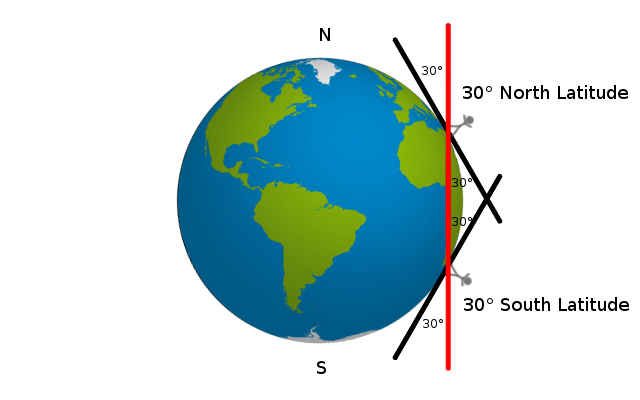 In the Northern Hemisphere, the North Celestial Pole is above the horizon, and the South Celestial Pole is an equal distance below* the horizon. 4. In the Southern Hemisphere, the South Celestial Pole is above the horizon, and the North Celestial Pole is an equal distance below* the horizon. 5. The North Celestial Pole is due north. The South Celestial Pole is due south. They are in exactly opposite directions from one another. * Obviously we can't actually see the celestial pole that is below the horizon. However, we can approximate it's position by extrapolating the paths of the stars. The earth is a rotating sphere. From our perspective, the stars appear to be rotating around us. The elevation of each celestial pole depends on your location on the earth. 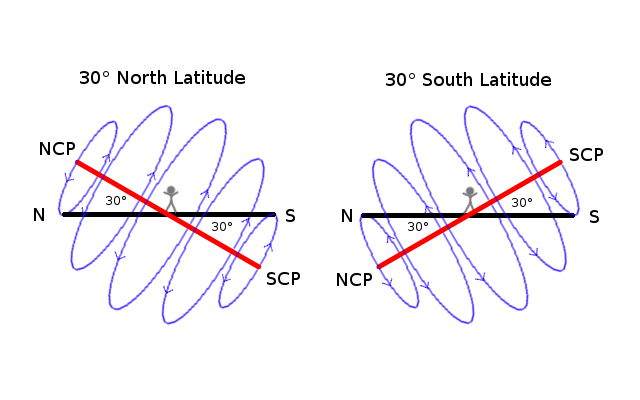 At 30 degrees north of the equator, the North Celestial Pole will be 30 degrees above the horizon and the South Celestial Pole will be 30 degrees below the horizon. Likewise, at 30 degrees south of the equator, the South Celestial Pole will be 30 degrees above the horizon and the North Celestial Pole will be 30 degrees below the horizon. You can confirm for yourself that the elevation of each celestial pole corresponds exactly with your own latitude. However, this still presents some problems. 1. There has never been a report of anyone seeing an intersection between the various South Celestial Poles. Considering that mankind has been navigating the oceans by the stars for several hundred years, this seems unlikely. 2. The South Celestial Pole is always exactly due South. It is always 180 degrees in the opposite direction of North. In the "Celestial Gears" model, moving east or west would cause the South Celestial Pole to no longer be due South. There would be a non 180 degree angle between the North Celestial Pole and South Celestial Pole. The Bipolar Model has the exact same problem. In conclusion, the visibility of the South Celestial Pole is in direct contradiction with the flat earth model. The earth isn't flat. SCP is a lie. There is noone on the South Pole. Because there is nowhere as SP. if it is really there, so why nobody can't show us the compass turning on the SP like NP. ? Because there isin't SP. You live in the Northern Hemisphere and cannot see where in the sky the South Celestial pole is, so stop making untrue claims. I live in the Southern Hemisphere and I know that the Southern Cross and the South Celestial pole are both very real. Anyone who says otherwise is simply ignorant of the facts or is intentionally trying to deceive us! As we understand very well that all of you are saying lie. You are just argue what you need for say against FE's. But you are not true. 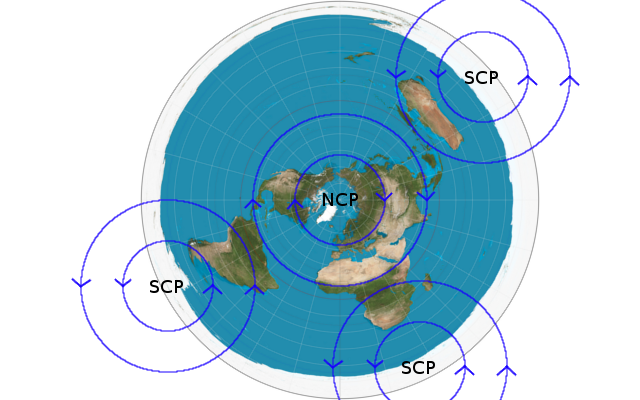 Just prove what you say with use to compass on the SP like NP. Why don't you do that? because it is a lie. You are just working a job depends on saying lie. If not, why don't you prove you are true? Your compass has nothing to do with it. 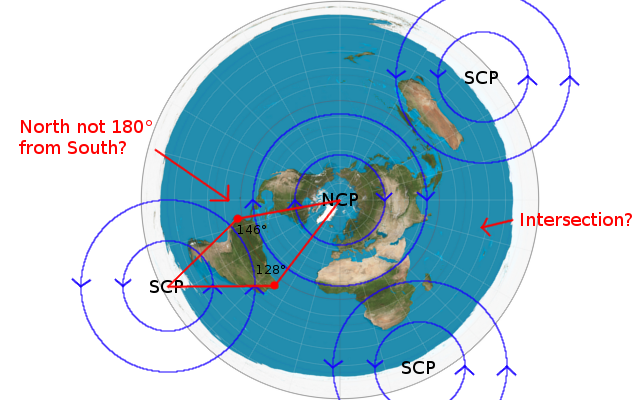 Here the North end of the compass points about 11° East of true North and the South end points about 11° West of true South. I can't help it if you are ignorant about the Southern Hemisphere! The fact is that down here the stars appear to rotate clockwise about a point we call the South Celestial Pole. Where I live, the South Celestial Pole is exactly South (not magnetic South) and about 27° above the horizon. The constellation Crux (Southern Cross) rotates about the South Celestial Pole and about 30° from it. Now you can jump up and down as much as you like, but that is all perfectly true. Look it up in any reference you like, unless you think that you are the great infallible "İntikam" who knows everything that there is to know. We'll, I am afraid in the posts you been making lately you have proved that there is lot that you do not know about the earth. So stop being such a "know-it-all" and admit that you are wrong, because in this matter of the South Celestial Pole you most certainly wrong. Stop with talking me continuesly saying "stop for this, stop for that". Be sure you can't stop me. be sure nobody or nothing can the capability of stopping me. My moving will forward to down all of the system depends on lies. You are just some liars just working for confusing the people. Your tactics don't work on me. Still don't you understand it? I'm not a stupid. I'm extra clever, extra faithfull and stepped foot firmly on the ground. So stop trying to divert me to believe your nonsences or left believing to the truth. You can not succeed it. I'm telling you prove the south pole is exist with compass. You can prove magnetic south except Geographic south. As both us know that you can't do that because there isin't. So now you must start to producing confusing lies. Lets start! I know what I see with my own eyes, you only have you own guesses. No-one can prove that the South Pole exists using a compass and you cannot prove it doesn't exist with a compass. The South Magnetic Pole is thousands of miles from the South Pole. Still I don't care any more what you claim. It doesn't alter any or the facts. And you never care about facts or evidence, you think you are so smart that you know everything, well you don't, but keep dreaming. Sounds like întikam needs to learn the difference between magnetic, and celestial poles. Intikam, this thread is about the South Celestial Pole. Not the magnetic south pole. Not the geographic south pole. Sounds like întikam needs to learn. If you don't care any more what i claim, so why do you still trying to answer almost all of my posts? Because you need to me for feeding. You are nothing without me or who like me. I answer you posts because others need to know just how wrong you are, that is all! I don't care what YOU think, you are totally indoctrinated with the idea that the earth is flat so as far as you are concerned anything against you belief must be faked or a lie. but i have to tell you that you are often wrong. You might not read my posts, but some others might and find out where you are wrong. The educational system in turkey leaves much to desire, it seems. Ignored by Intikam since 2016. That's if he bothered listening! I think that he always knew that he knew better than anyone else, so school could teach him nothing. I wonder what he thinks of LyngSat, Free TV from Turkey? Intikam, if you were clever enough, you could find someone in southern Africa and someone in southern South America, and then on a clear night in June or July, when it is night time in both places, they could point their webcams southwards and you will see the same stars from both continents at the same time. Try explaining this when South is in a different direction by over 90 degrees on the FE map! Too much for your mind to handle? I expect the normal reply of 'you prove it' from you, but then when someone posts the pictures you will say 'obviously faked' or something similar. It is impossible to get through to someone like you. Think OUT of the box. Be a TRUTH SEEKER! You may wish to decipher how many squares are there in the 4x4 matrix of my profile image. If you do, tell me! That way I can tell if you really have an imaginative/creative mind that knows how to think out of the box. If you got it right, you've got great potential of becoming a genuine Truth Seeker! Welcome then to the Truth Seeker's group! The educational system depends on according to opinion of atheist / satanist /NASA. So it means nothing. The only reality is IQ's of 160. Do not worry. After i prove gravitation's fake, all you will get like educated. What has that to do with "The South Celestial Pole"?